Thalassemia (British English: thalassaemia) is a group of inherited autosomal recessive blood disorders that originated in the Mediterranean region. In thalassemia the genetic defect, which could be either mutation or deletion, results in reduced rate of synthesis or no synthesis of one of the globin chains that make up hemoglobin. This can cause the formation of abnormal hemoglobin molecules, thus causing anemia, the characteristic presenting symptom of the thalassemias. Thalassemia is a quantitative problem of too few globins synthesized, whereassickle-cell disease (a hemoglobinopathy) is a qualitative problem of synthesis of an incorrectly functioning globin. Thalassemias usually result in underproduction of normal globin proteins, often through mutations in regulatory genes. Hemoglobinopathies imply structural abnormalities in the globin proteins themselves. The two conditions may overlap, however, since some conditions that cause abnormalities in globin proteins (hemoglobinopathy) also affect their production (thalassemia). Thus, some thalassemias are hemoglobinopathies, but most are not. Either or both of these conditions may cause anemia. The two major forms of the disease, alpha- and beta- (see below), are prevalent in discrete geographical clusters around the world - it is presumed associated with malarial endemicity in ancient times. Alpha is prevalent in peoples of Western African and South Asian descent. It is nowadays found in populations living in Africa and in the Americas. It is also found in Tharu in the Terai region of Nepal and India. It is believed to account for much lower malaria morbidity and mortality, accounting for the historic ability of Tharus to survive in heavily malarial areas where others could not. Beta thalassemia is particularly prevalent among Mediterranean peoples, and this geographical association is responsible for its naming: Thalassa (θάλασσα) is Greek for the sea, Haema (αἷμα) is Greek for blood. In Europe, the highest concentrations of the disease are found in Greece, coastal regions in Turkey, in particular, Aegean Region such as Izmir, Balikesir, Aydin, Mugla, andMediterranean Region such as Antalya, Adana, Mersin, in parts of Italy, in particular, Southern Italy and the lower Po valley. The major Mediterranean islands (except the Balearics) such as Sicily, Sardinia, Malta, Corsica, Cyprus, and Crete are heavily affected in particular. Other Mediterranean people, as well as those in the vicinity of the Mediterranean, also have high rates of thalassemia, including people from West Asia and North Africa. Far from the Mediterranean, South Asians are also affected, with the world's highest concentration of carriers (16% of the population) being in the Maldives. The thalassemia trait may confer a degree of protection against malaria, which is or was prevalent in the regions where the trait is common, thus conferring a selective survival advantage on carriers (known as heterozygous advantage), and perpetuating the mutation. In that respect, the various thalassemias resemble another genetic disorder affecting hemoglobin, sickle-cell disease. 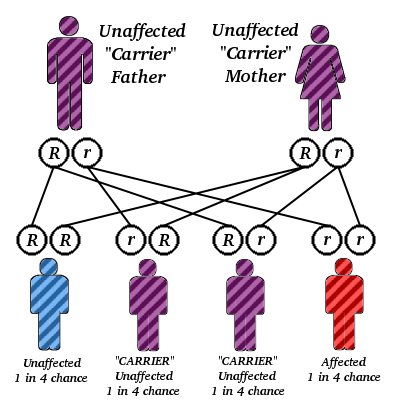 Both α and β thalassemias are often inherited in an autosomal recessive fashion, although this is not always the case. Cases of dominantly inherited α and β thalassemias have been reported, the first of which was in an Irish family with two deletions of 4 and 11 bp in exon 3 interrupted by an insertion of 5 bp in the β-globin gene. 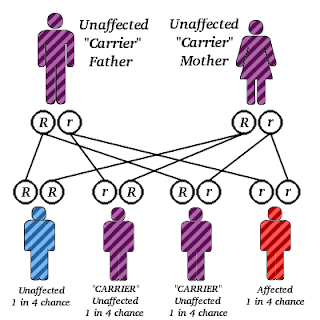 For the autosomal recessive forms of the disease, both parents must be carriers in order for a child to be affected. If both parents carry a hemoglobinopathy trait, there is a 25% risk with each pregnancy for an affected child. Genetic counselingand genetic testing is recommended for families that carry a thalassemia trait.